The analysis presented throughout the paper, however, paints a picture of declining competitiveness over the past decade. “International student mobility flows to the UK decelerated significantly in the aftermath of the global financial crisis of 2008/09,” notes the report. Indeed, and as the following chart reflects, foreign enrolment in British higher education has been essentially flat since 2010/11. 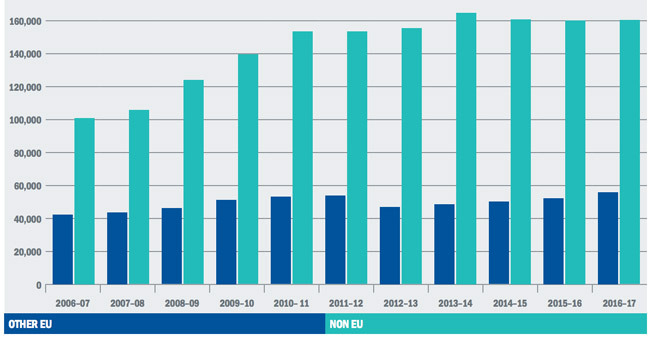 From 2010/11 onward, UK universities report greater enrolment growth for non-EU students relative to those arriving from elsewhere in the EU. But that growth pattern sputtered between 2010/11 and 2012/13, mainly as a result of declining Indian numbers, and non-EU enrolment growth has levelled out in the years since. Meanwhile, other major study destinations – notably Australia, Canada, and China – have registered much more dramatic growth in foreign enrolment over the same period. Driven in part by continuing strong demand from India, the number of international students in Canada has increased by just under 120% between 2010 and 2017, and by 41% between 2015 and 2017 alone. Australia’s international higher education enrolment grew by 15% between 2016 and 2017. And the number of visiting students in Chinese degree programmes also grew by 15% last year. These observations are reinforced by a recent research paper from the Centre for Global Higher Education at University College London. As the title suggests, The UK in the global student market: second place for how much longer? offers some pointed commentary on the narrowing gap between the UK and competing study destinations. The paper focuses on Australia’s growth in particular, but, as the recent-year statistics we have noted above suggest, the same observations of increasing competitiveness could also be made of China and Canada. This recommendation is grounded in a number of important market factors, including the pending impact of Brexit (and any resulting changes in fee status for EU students in the UK), the policy and political climate in the US (including any changes to post-study work rights for international students), and ongoing fluctuations in world currency and commodities markets. This entry was posted in Europe, Higher Education, Regions, United Kingdom and tagged .